Tina's working studio and showroom at Whiting Mills, Studio # 305, in Winsted, CT, is open to the public Saturdays and Sundays from 11:00 am to 4:00 pm, and also by chance or by appointment (860.309.6934) Monday through Friday. Unless away at a show! Tina is currently exhibiting a piece in the "Context" Exhibition at the Fuller Craft Museum in Brockton, MA, which runs from October 27, 2018, through February 24, 2019. Tina's next show is the 12th Annual Holiday Open Studios at Whiting Mills in Winsted, CT, December 1 & 2, 2018. 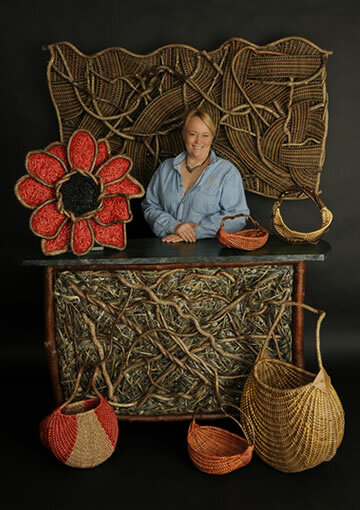 © 2006-2018 Tina Puckett, Tina's Baskets and Woven Art, All rights reserved.